Book 1 (my review here, in case you’ve not yet read it) set up what promised to be a truly epic story – a promise which The Other Lands and The Sacred Band fulfilled wonderfully. The novel doesn’t open, thankfully, immediately after the events of Acacia – a risk on David’s part, since we were met by characters who were subtly different from when me were introduced to them in Acacia, but a risk that paid off. Not only did David manage to show and explain how the characters had grown since I last read about them, but he also managed to set in motion the new cycles of growth and change that needed to happen to push not only the characters but the plot forward. After all, in Acacia we were shown a small part (yet a very important part) of the world David created – books 2 and 3 needed to show more of this world, and did. The same can be said of many of the characters in the book – Corrin Akaran terrified me at the end of Acacia, and she continued to evolve in The Other Lands – I couldn’t help but compare her to Cersei Lannister, and to be honest, I don’t know who would come out on top if the two had to clash. Mena’s search for her place in the world (other than being an Akaran and the embodiment of a goddess) was heartfelt and beautiful, and I loved Dariel’s progression in the book, too. Each of the siblings reacted to the previous book’s events in ways that were both true to themselves (and to what they had survived) and in ways that echoed with me – one of the ways that we live through characters in novels, though they may be set in Fantasy-worlds) is through the character’s humanity and the author’s ability to evoke sympathy and empathy, something that David succeeded massively at in The Other Lands. And the world that David created expands – Dariel travels to The Other Lands and I loved the strangeness, intensity and brutality of this place. Not only was it an excellent crucible to test and temper Dariel, but a way to explore a world intimately linked to the Known World but also brazenly different – it was handled and explained so well that I’m unable to decide which place is better. The build towards the novel’s climax was suitably inexorable and tension-filled – the menace was palpable, leading me to not even want to guess at the conclusion in Book 3; the ‘good guys’ just seemed so overwhelmed that I had no idea how they were going to survive or triumpf – a very good thing to keep readers hooked and worrying. All things considered, The Other Lands was an excellent bridging novel between the beginning of the trilogy and its conclusion in that it wasn’t only a bridging novel: it was a tale all its own, carrying forward some of the arcs (plot- and character-wise) from Book 1, creating satisfying new arcs, and leaving mysteries for The Sacred Band to explain. It’s the kind of novel that stands above most of the other Epic Fantasy novels on the shelves today – not least because of David’s Historical Fiction background, and shows that David is not only an author who can build convincing worlds but also a writer who excels at telling the all-important human stories within his beautiful and fantastical canvas. Highly recommended! And now we come to what, especially in Epic Fantasy, is considered the make-or-break volume in a trilogy: the final book. The first thing I’ll say is that I was pleasantly misled by the wonderful cover – and that David seems to have had the foresight to write a tale that not only explained the cover but then also surprised us with that explanation. Too many times a novel (especially Fantasy and its attendant sub-genres) are judged by the covers – whether in the stores before purchase or after putting the book down, and its rare that a cover manages to suit the novel (notice the plethora of Character-focused covers nowadays), so when an author manages to write a novel that gives the prospective reader an idea of what is awaiting him or her in the book -without having any directing input in the creation of the cover- that’s a well-done thing indeed. 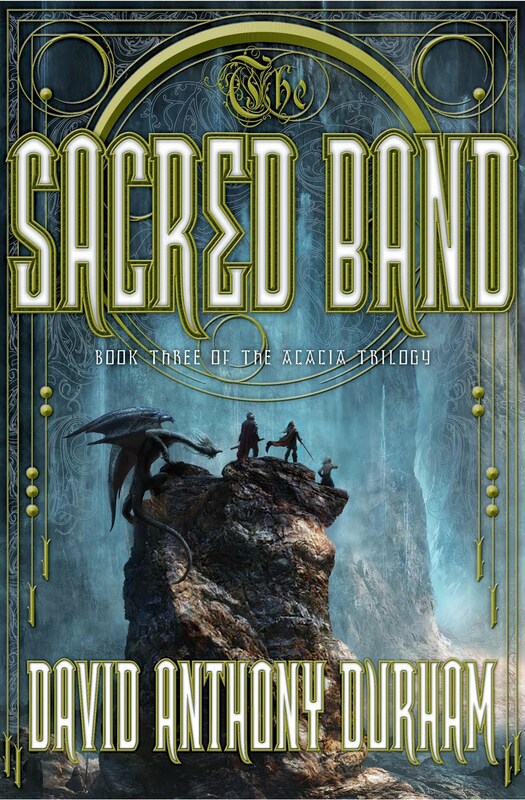 I know that David wrote the book first, believe me, but I truly like the cover for The Sacred Band because of the many layers of stories in the cover, all present in the novel. 🙂 So, (whoever you are because I just can’t seem to find info on the artist / designer of the cover), well done, awesome cover! To order your copies of The Other Lands, click here for Amazon US, here for Amazon UK, and here if you’re in South Africa. To order your copies of The sacred Band, click here for Amazon US, here for Amazon UK, and here if you’re in South Africa. UPDATE: Thanks to fellow reader Andre Philander, the guy responsible for The Sacred Band’s awesome cover is Paul A Romano. Thanks Andre! Final UPDATE: It appears Andre made a mistake and that Wikipedia is also wrong: the true artist is this man – and he work is AWESOME. New WoT Book 12 Release Date & David Anthony Durham Wins! Now onto news from David Anthony Durham, author of the incredible Acacia – he was down at Worldcon for a few days, chatting to author-folk, part of panels and such, and then he won this award – AWESOME AWARD – and you know what, David thoroughly deserves it! 🙂 Now, if you’re wondering why David won the award, then get Acacia, Book 1 of The War with the Mein. You’ll know why! 🙂 And then you can join the ever-increasing legion of fans worldwide in anticipation of the sequel to Acacia – The Other Lands! I just this morning got something from my editor, and I immediately thought of showing it you guys. 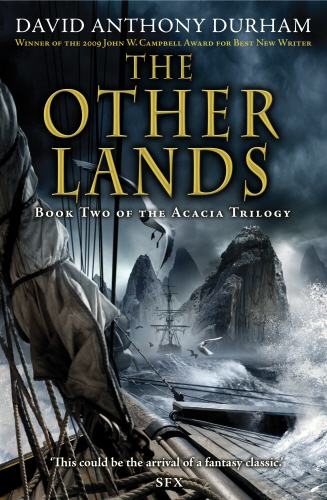 You were so kind to Acacia when it came out, and I’m really keen to make sure you and your readers know that the follow up, The Other Lands, is really coming soon! I’m putting the finishing touches on the manuscript right now, but Doubleday has already gone into production on it. Looks like the Sept pub date might really happen. I think the UK and the French won’t be far behind either. As part of what Dday has been up to, they’ve just shown me the cover! I’ve attached it. You may recognize the cover image from the German edition of Acacia. Strange but true, Doubleday fell in love with it enough that they wanted to do their own version of it for The Other Lands. The apocalyptic struggle against the conquering Mein now won, Queen Corinn rules over the Acacian Empire of the Known World with a stern hand—aided by increasing mastery of the occult powers contained in the Book of Elenet. But far across the seas the mysterious inhabitants of the Other Lands seemingly control the fate of her empire—supported as it is by an underground trade in drugs and slaves. When she sends her brother Dariel on a secret mission across the hazardous Grey Slopes to investigate, it begins another cycle of world-shattering and shaping events. In this bold and imaginative sequel, David Anthony Durham’s epic imagination continues to expand the Known World of the novel into yet undiscovered lands, drawing on a literary tradition that stretches from The Iliad to George R.R. Martin. Those who know me and the fact that I’m both a blogger and work in a bookshop (and therefor, have a tenuous connection to the publishing industry) think that I’m damn lucky; I love reading, have a huge book collection, get discount when I buy, (used) to go to publisher’s evenings and got free books, people from all over the world (hopefully) now take my opinions into consideration when deciding what to read next, and the three major publishers here in South Africa send me books to review.